Today . . . I am over at Common Craft listening to Lee LeFever's video on social networking. The cool thing about Common Craft is that their product is explanation. Explanation! Now how cool is that!?!?! And explain things they do, in simple, short, easily understood video bytes. Social networking is an important consideration for all entrepreneurial women working from home and using the Internet as their primary way of doing business. Watch this less than 2 minute video to see how social networking could boost your business. Next, read Five Reasons Social Networking Doesn't Work to get a fair and balanced perspective. Then, tell us your view of social networking for business success. Does it or doesn't it work? Is it or isn't it useful? I find myself agreeing with Molly Wood. While the idea sounds hopeful, I've seen it in action. In my life, it's been a great way to reconnect with out-of-touch colleagues, but not so useful in terms of business success. I believe that opportunities arise as a result of our connection with source. If joining one of these sites feels like the right thing to do, then by all means. I'm sticking to plan A.
I see what you mean, Dana. 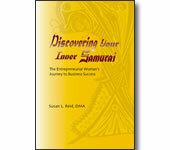 Why join a social networking group when you've already got an Inner Samurai source networking on your behalf! It's the difference between connecting to give and connecting to get.